I spent the day wandering around western Maryland with Dan Wagner, a soil geologist who is working with us on the C&O Canal project. I have learned most of what I know about soil by following Dan around while he works, and I very much enjoy these excursions. Today was a glorious spring day and we worked on some great sites, so it was best fun. 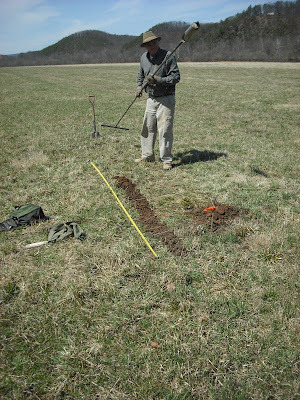 In these pictures Dan is using a bucket auger to bore a hole into the deep soils along the Potomac River. He removes the soil from the auger carefully and lays it out along the ground next to a tape measure, recreating the buried soil layers on the surface where he can examine them. 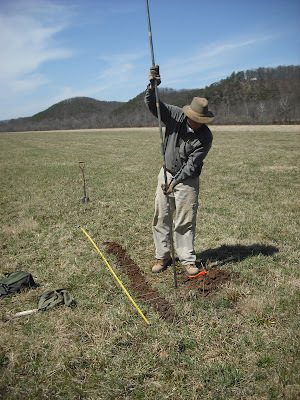 This way he can spot buried topsoil layers that might hold archaeological sites and estimate their age. Or, he can determine that all of the soil in an area is recent to a depth beyond where we can reach with a shovel, so we don't waste time digging where nothing will be found. One of Dan's holes hit rocks 1.5 feet down in a place where there shouldn't be any rock that close to the surface. We dug down with a shovel and discovered that we had hit a large prehistoric hearth, probably around a thousand years old. I know those rocks don't look like much, but they are broken in the way rocks are typically broken in hot fires. We will be back later to find out if this is just a small camp site or something much bigger. Today I went to view some features in the woods near Washington that turned out to be nothing. But they were right next to the stone yard for the US Capitol. There are several stone yards around Washington, where odd bits of stone from the monuments are kept, in case they need an extra bench or capital or just a stone like the ones in the walls. This one was wonderful, a huge jumble of mysterious hunks of stone, much of it overgrown with vines, making me feel like I was discovering a city in the jungle. Interesting long profile on Freeman Dyson in the NY Times Magazine. Dyson was a wonder-boy physicist, one of the pioneers of QED in the 1950s, and he has gone on to be one of our most interesting thinkers. He has an extraordinary optimism about the future and a habit of opposing the current scientific consensus. So it is no surprise to find that he has come out against global warming alarmism. Dyson once wrote a book on the future of biotechnology in which he imagined engineering termites that recycle junked cars and cuddly dinosaur-shaped pets. He thinks, according to the Times, that if global warming gets to be a problem we will engineer "carbon-eating trees" and plant them around the world. Like Dyson I am very impressed by the technical skill of our species, and I tend to think that it the very long run he is probably right. If things go on as they are going, within a century we should have all sorts of technologies for controlling our atmosphere and regulating its carbon content. What I worry about is the timing. Around the world I see the industrial age with its unending crises sputtering out. The rate of population growth is falling almost everywhere, we are finding ways to reduce our output of toxins and and even clean up some of the mess we have made, we are working hard to prevent the extinction of species. In my optimistic moments I see a future of clean technology, lower populations, and vast wealth, in which our biggest problem is boredom. In my gloomy moments I see a world of increasing division, in which islands of wealth and science strive to insulate themselves against a world of poverty, misery, and religious fanaticism. In the second vision, the vast regions still stuck in the industrial age continue to pollute the planet to a degree beyond what it can sustain, and the sea rises to Miocene levels, drowning our coastlines, driving a billion people form their homes, and leading to an era of warfare and terrorism. Two lines of ditches were dug around the settlement. They can't have been defensive because they weren't continuous. Nor were they intended for use as an ossuary, as the Linear Pottery people generally buried or burned their dead. However, during a rescue dig just before the area was developed as an industrial estate, in some of the ditches archaeologists uncovered tens of thousands of ­human bones. "It is impossible to establish direct proof of cannibalism. 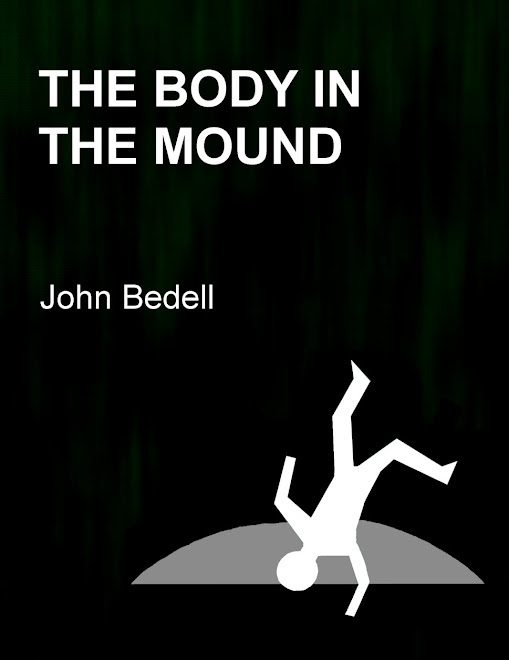 But here we have systematic, repetitive gestures, which suggest that the bodies were eaten," says Boulestin. 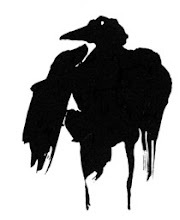 The marks of breaking, cutting, scraping and crushing indicate that the bodies were dismembered, the tendons and ligaments severed, the flesh torn off, the bones smashed. The vertebra were cut up to remove the ribs, just as butchers do today with loin chops. The tops of skulls were opened to extract the brains. Another telling clue is that there are proportionately fewer bones containing marrow, particularly vertebrae and short bones, suggesting they were set aside. A quick investigation of the bones in neighbouring ditches showed that they had suffered the same fate. Extrapolating to the whole site, only half of which was excavated, about 1,000 people must have been butchered. There is no other example in prehistory of a mass grave of this size. "We are dealing with an exceptional event," says Zeeb-Lanz. . . . Given the difficulty of explaining how such a small community ate so many people, the excavators have suggested that Herxheim served as a ritual center for the surrounding area. People from miles around brought their war captives to the site to eat them. One can imagine how this came about: in a time of crisis, perhaps a war coupled with a food shortage, a charismatic shaman emerged at Herxheim, offerning a solution. The prophet instituted grand rituals, probably pieced together from a mix of old local traditions and borrowings from others, with perhaps an innovation or two. At the height of the ceremony, amidst wild dancing, whirling torches, and crashing music, the captives were sacrificed to their gods. The participants then shared a ritual meal of human flesh. Or perhaps, as with some Indian tribes, there were special people surrounded by taboos -- eaters of the dead -- who ate the flesh for the community. It was cool today but sunny, with a brilliant blue sky. I walked around my office enjoying the signs of spring. This is the Blue Yard, which I have always enjoyed. All the flowers are blue or white, all summer long, and I think this striking color scheme is a nice thing to do with a little, very public yard like this one. Since I cannot imagine why anyone would plant orange and mauve pansies under this pink magnolia I assume, as I do with all things I don't understand, that it must be Art. Clearly this installation is a commentary on our social scene. The artist is asking us to remember that although it may be a pink magnolia spring for rich white Democrats, there are others -- auto workers, the poor, the oppressed, the people of Darfur, former Bush administration officials -- for whom life is all tricks and no treats. The British Humanist Association is currently running a campaign against religious faith. It has bought advertising space on our city buses, which now patrol the streets declaring that "There probably is no God; so stop worrying and enjoy life." My parents would have been appalled at such a declaration. From a true premise, they would have said, it derives a false and pernicious conclusion. Had they wished to announce their beliefs—and it was part of their humanism to think that you don't announce your beliefs but live them—they would have expressed them thus: "There probably is no God; so start worrying, and remember that self-discipline is up to you." I sometimes find Scruton's religiosity annoyingly smug, but I agree with him here. The bus ads are stupid, and the "humanism" of the British Humanist Association (vice president: Richard Dawkins) is appallingly negative. They spend all of their energy attacking religion and have trouble saying what they area for, other than freedom. All of the crap about what a great force for evil religion has been is completely spurious. Sure, religious people do bad stuff, but so do atheists. The only possible conclusion is that neither the presence of religious belief nor its absence makes us good; we have to look somewhere else for answers to our ethical and political problems. Ben read to me last night. I asked what he wanted to read and he passed over the stack of library books to pull out one of his old favorites, Bones, Bones, Dinosaur Bones by Byron Barton. Except for the names of dinosaurs, he read every word, stumbling once over "have" and once over "and," a word against which he seems to have a personal block. He has a lot of the book memorized, which I suppose is how he was able to read "These are the bones of Tyrannosaurus Rex." But he was getting all the variations in sentence structure -- "we have" vs. "these are" -- so he wasn't working just from memory. It was very exciting, especially because it was his idea and he was excited about it. He wanted to show me that he can read. Today was the first real day of spring in Catonsville. It was warm for two days a while back, but the ground was too wet to do anything but walk in the sunshine, and no flowers were blooming. Today it was warm, the daffodils and early cherries are starting to bloom, and the soil was dry enough to get my hands dirty. I spent two hours weeding one of my beds and digging lime and peat moss into the open spaces between the perennials, where I will plant marigolds and cosmos -- this is an open bed, without nets, so only things that deer won't eat can survive there. It was a blissful time, even though the maple trees are also blooming, and the evil miasma of pollen has entered my system with all its baneful consequences. My little children were outside playing all afternoon. I took this picture as a record of what the garden looks like at the start of spring. I will be taking these from time to time throughout the year, posting a record of how things look on the south side of my house. Note the gate, which I repaired yesterday after Robert broke it. He tried to jump the fence and didn't quite make it. He was fine but the gate was lying crumpled on the ground, torn from its hinges. "My bad," he said cheerfully, and then waltzed off to play video games. No Olo has done okunikua since some time before the turn of the last century. . . . The Olo witch who did it, whose name the Olo never mention, was annoyed by French civilization and wished to make it go away, which in time, of course, it did. The Olo patriarchs considered that the two World Wars, the Great Depression, and the consequent reduction of the great colonial powers to little postcard nations were a direct result of this guy's okunikua. They approved of the result but, as moral people, thought the means excessive. Western historiography does not agree, since it is much more logical to assume that millions of fairly rational, marvelously educated, prosperous people went crazy and ripped the heart out of their own civilization. In which our young heroes learn a lesson about thinking ahead. Last night my 16-year-old son Robert and his friends went to the "battle of the bands" at their high school. At about 9:30 they called me to pick them up. I arrived, but they didn't run over to the car. I shouted. They made obscure hand gestures. I shouted again. Robert came over to the car. "We can't go yet," he said. "We're trying to get Alec's backpack off the roof." Then he ran off again, leaving me blocking traffic in the pick-up lane. I parked my car and made my way over to the school, where I could see that there was indeed a student backpack on the school roof. It was only about 15 feet off the ground, but I could see that the arrangement of the roof would make it very difficult to climb. As I watched, several volunteers tried the ascent and failed. I said, "How did Alec's backpack get on the roof?" Robert said, "Um, I threw it there." "I'm 16! I don't need a reason!" Robert said that they had spoken to a teacher and he was certain that a janitor would be arriving any moment with a ladder to get the wayward pack down. I pointed out that it was 10 PM on a Friday night, and there was absolutely no chance that a school janitor with a ladder was going to appear. They still wanted to wait. I said, we'll get it down tomorrow. They were still hemming and hawing, so I walked to my car and started it. They ran over, and I drove everyone home. This afternoon Robert, Alec and I went back to the school to retrieve the backpack. They were very nervous about carrying a ladder onto school grounds, which reminded me of the great advantages of being a grown-up. I know enough of the world to know that no one would really be mad, and that the kind of policemen and school officials who would use the affair as an excuse to yell at teenagers wouldn't yell at me. So the backpack is safe and dry, and I don't think any of them will be throwing valuable things onto the school roof again any time soon. But as formerly sworn enemies filed into a provincial church on Friday to mourn as one, the funeral of the slain policeman provided the latest and most powerful demonstration of the ways in which the province’s people and its leaders have united against a return to the violence that racked Northern Ireland for 30 years. Rallies that drew thousands to silent vigils this week in Belfast and other major towns across the north, and dozens of interviews across the province, suggested that the old antagonists — Roman Catholics and Protestants, nationalists seeking a united Ireland and Unionists committed to keeping Ulster a part of Britain — remain determined to settle their future in peace. One of the week’s most arresting moments came when Martin McGuiness, a former I.R.A. commander who now serves as the province’s deputy first minister, visited Kate Carroll, the policeman’s widow, and called the constable’s killer’s “traitors” who should be turned in to the police, a demand that many in Northern Ireland said no senior member of the republican movement had ever made before. The change is heartening, and it gives one hope about our species. I think what Burns leaves out of his account is the way the conflict has been reshaped by social and economic changes in Ireland. Thirty years ago Protestants saw Ireland as a backwater inhabited by ignorant peasants, and they wanted to remain part of modern, wealthy, cosmopolitan Britain. Catholics very much resented this attitude. The north at that time was much richer than the rest of the island, better educated, more urban, more industrial. But as Ireland has developed, achieving very rapid economic growth, the influence of the Catholic church has lessened, and it has come to seem to the British as a much less absurd place. On the other hand the north has de-industrialized like the rest of Britain, and the development of new economic activities has been greatly hindered by the ongoing violence. So the two parts of the island have become much more alike, economically and socially, and that has greatly aided the peace process. While I'm on the subject, the rapid development of Ireland has been made possible by the European Union. Ireland has become the perfect place for American firms to set up a foothold within the EU, with lower wages than England or Germany and close ties to the US. So in this case the dream of the EU's founders, that economic unity would eventually end war on the Continent, is working very well. Can they -- can they do anything? I spent the day in Western Maryland, working along the C&O Canal. It was a cool day, 45 or so, overcast and breezy. The landscape had the bleak feel of forests with no leaves, but was still lovely. To get there I had to pass through Cumberland, an old factory town that is about half boarded up. Then I spent the morning in an industrial park a few miles south of town, enjoying the smells of the sewage treatment plant, the roar of the cement factory, and the charming atmosphere of the federal prison with its mile of razor wire. But there was still that wonderful view out over the floodplain of the Potomac to the mountains beyond, lots of beaver dams and lodges, and the other charms of early spring in the woods: woodpeckers, geese, ducks, and a woodcock that flew up right in front of me. In the afternoon I went to prettier places and found two new archaeological sites. All in all, it was a grand day. If it is true, and I think it is, that belief in God and an afterlife is largely a way of coping with circumstances that we can't otherwise tolerate, this establishes the agenda of secular humanism: to build a world in which nobody needs such crutches, because everyone's life is acceptable as it is. I know we will probably never get there, but to me this is a goal worth striving for. Tomorrow night NASA is scheduled to launch the Kepler satellite, which is designed to search for extrasolar planets roughly the same size and distance from their suns as earth. Finding planets has gotten routine -- as of today the official count is 342 planets orbiting 289 stars. But all of these are either very large or very close to their suns. No earthlike planet has yet been found. So here's to Kepler and the brains behind it, hoping they find many worlds for us to dream about. It's going to take some time, though. To confirm a planet's orbit takes three or four transits, and a planet in an earthlike orbit has a period of about a year. 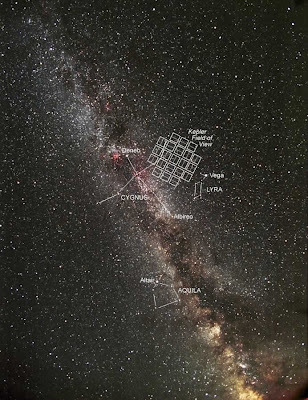 The picture shows the part of the sky Kepler will be searching. 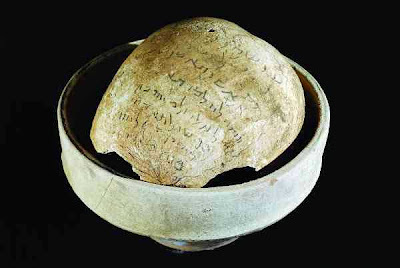 In the Biblical Archaeology Review, a little piece on a fascinating artifact from the 3rd to 7th century AD: a human skull on which magical incantations had been scratched in Aramaic. At least four other such skulls of the same period are known, as well as hundreds of similar spells scratched on pottery. Many of the spells invoke demons, including Lilith, who at that period was known mainly as a demoness who attacked birthing mothers and newborn babies. 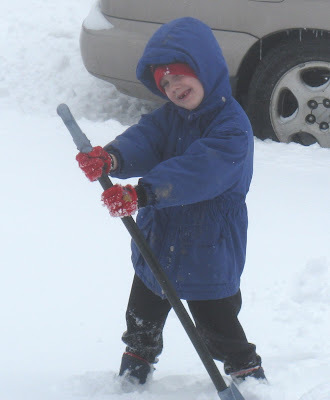 Snow is one of the best reasons to have children. Without them it it sometimes just cold and wet, but their joy at the wonder of it is infectious. It isn't that unusual for us to have snow in March here in Maryland, but usually when this happens it is barely below freezing and well above by the next day, so our March snow is mostly slush. Not this time. It started snowing in earnest late last night, but that must have subsided soon because I was disappointed to wake up at 5 AM and find only two inches or so on the ground. But school was canceled, so I kept to my snowstorm plan and stayed home. Around 7 AM it started snowing hard again and it kept up until 9, and by then we had four or five inches in our yard and the streets were so slippery people had trouble driving up the very modest hill out my dining room window. It was about 25 degrees at that point, and the snow was coming down dry and fluffy. After the snow let up I hunted up the boots and snowsuits that hadn't been used all year and took the little kids outside. Ben was fixated on making a snowman. I tried to tell him that this wasn't the right kind of snow, but he insisted on finding out for himself. After that failure, he and Zhen Zhen made snow angels while I shoveled the walk. I was fixated on sledding, which I hadn't done in two years. After lunch I tried to get Ben and Zhen Zhen suited up again. Ben decided to get nervous and have a fit. Despite my best efforts I couldn't persuade him to come, so I left him home and took Zhen Zhen. We had great fun, although she liked being pulled on the sled more than going downhill. By the time we got home Ben was over his snit and ready to go, so I put Zhen Zhen down for her nap and set out again. I took Ben to the big hill at the high school, and he loved it. Now I feel like I have done the snow day thing right, and I can relax.